The term ‘buyers market’ can be a scary term in the residential development world. But, the truth is that savvy developers and project marketers don’t need to fear difficult market conditions – they just need to know how to make the most of them. With 228 architecturally designed apartments to be sold, Belise Apartments developed by Reed Property Group and Group Kildey is one example of a project that thought outside the box in order to secure sales targets and to move stock in less than ideal conditions. PPS Tailored Furniture Solutions, this is a prime case study developers should look toward as an example of understanding and using market conditions to succeed. “A buyers market doesn’t mean that a developer has to struggle to meet pre-sales targets, it just provides a different set of challenges and opportunities for project marketers to take on,” Mr Conias said. According to Marc Conias from PPS, one of the most powerful ways Belise Apartments took on a buyers market was by offering the right incentives to entice potential buyers. “In a buyers market, your potential buyers are always looking for that extra incentive to get them to sign on the dotted line and that’s exactly what the Belise developers offered,” Mr Conias said. According to Graham Kildey Managing Director of Group Kildey, having a well-designed building – right down to the furnishings – is a great incentive to entice potential buyers. “The best incentives a developer can provide to any purchaser in the market are: a well located development with access to alternative forms of transport and shops, and a well-designed building which exudes Pride of Ownership,” Mr Kildey said. Since the appetite for residential sales has changed over the last 6 months, developers need to look at ways to create unique developments that stand out from the other developments on offer. “We have a generous double height reception area, an in-house café/bar with outdoor dining facilities, an additional roof top recreation and dining area with BBQ facilities and extensive views to the city and Brisbane River,” property developer, Graham Kildey said. According to Marc Conias from PPS, these points of difference complemented the incentives on offer to provide an investment that was immediately on the radar of many residential investors. “A big difference with how Belise positioned themselves was by offering investors something unique that immediately got them noticed by potential buyers,” Mr Conias said. Each market cycle presents unique challenges and opportunities to developers – the trick is to understand how to take advantage of these and adapt your marketing to suit. Belise, for example, was faced with a difficult buyers market, so they used a number of tactics to appeal to a wider selection of potential buyers: owner-occupiers and investors. “Belise quickly understood and adapted to the market – they knew that it would be more difficult to move stock in a buyers market and they implemented tactics from the start that would have potential buyers focused on their product and not other projects,” Marc Conias from PPS said. In a buyers market, developers need to focus on what it takes to sway undecided buyers – that’s why it’s imperative that a development is positioned as a great investment, even if buyers are initially planning on living in the development. With their prime inner-city location, quality fixtures, and lifestyle additions Belise’s developers took the time to ensure that every aspect of the project was appealing to potential investors. “We have to keep in mind that investors are very commercially minded and are primarily focused on the balance between a good return on investment and keeping costs down – Belise has achieved this balance,” Marc Conias from PPS said. “The Belise developers saw that one way to attract investors was through offering turn-key furniture packages with their apartments. These packages can generate an increase of up to 20 per cent on rental yields and that is a hard fact for investors to ignore. 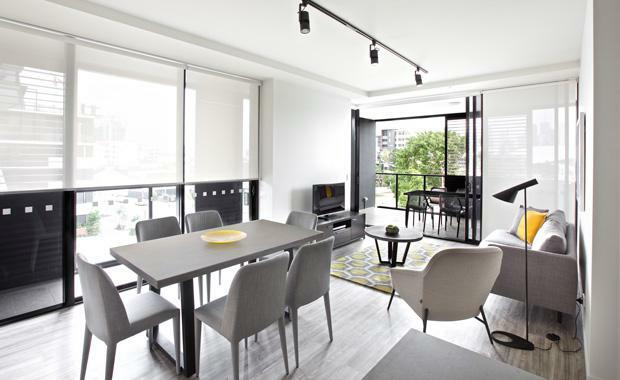 A turnkey furniture package is also a great way to shore up the rental guarantees provided by the developer – no matter the project – ensuring investors are drawn to the development in its early stages. Marc Conias is the Managing Director at PPS Tailored Furniture Solutions, a pioneering furniture package business that provides high-quality marketing collateral and furniture solutions to residential developments and leading project marketers across Australia. The Urban Developer is proud to partner with PPS Tailored Furniture Solutions to deliver this article to you. In doing so, we can continue to publish our free daily news, information, insights and opinion to you, our valued readers.